A project I’ve been wanting to work on for a long time is how to automate restores of our Production databases to the Test instance. There are a number of challenges associated with this. First, the restore has to be able to find which backup it needs to use. Secondly, many of our databases do not have their files configured in the same way (for example one may have a single .mdf and log whereas another may have multiple .ndf files). Third, restoring from a different instance causes the SQL Authentication users to be orphaned and therefore connections to the databases to fail. And this is just at the high level. There are many smaller complications along each of those roads. Because of these our restore model has typically been per-request, manually executed, and filled with many small and tedious steps. I wanted to replace it with one process that would restore all of the production databases from the proper backup, configure any “with MOVE” options dynamically, and fix any orphaned users. A secondary goal was also to make it as portable as possible so that I could easily reconfigure it for our other PROD/Test/Dev instances. The result of this labor of love is copied below. You’ll notice that at the top you can configure the Source and Destination SQL instances to be used, as well as the Data\Log paths for both. This is the section that allows me to reconfigure it for other instances. You can make these parameters that are passed in if you want to call it manually. For my purposes it is a scheduled process that always runs against specific instance. Following that section is an exclusion list, built to avoid system databases as well as any others you want to skip (use cautiously to avoid angering coworkers in the Development or Testing departments). The only function is one called “FixOrphans”. If you’ve guessed that’s where the orphaned users are repaired, then you’re today’s winner! This works by pulling a list of available logins from the destination, creating a list of orphans, and using the Source to find which login users should be matched to. It will also match “dbo” to a different login if that’s the way the Source database was configured. Of course, this breaks down if the logins are not named the same on both instances. This is the case for some of mine as well. In those cases I have a section at the bottom to take care of one-off scenarios by hard coding them. It isn’t ideal, but will have to do until I can change some policies in my organization. A fun side note about the FixOrphans function. It started as a small section of the script, then quickly grew to become its own function. I became so interested in what could be done with it that I side-tracked for a while and wrote a stand-alone script just for repairing orphans. Being a faithful reader, you will remember it being covered in Fixing Orphaned SQL Users via PowerShell. So, the restore project was actually first and fixing orphans spun out of that. I then took that work and rolled it back into the restore script, so the code will be very similar to that first post. After that function is declared we move on to the real work. A variable is created to store Source backup information so that we know which backup to use. It then loops through each of the objects stored in that variable. If the database is in the exclusion list it notes that and moves on. Otherwise, it sets a baseline for the restoration query and starts building on that. This is the portion that allows me to account for differing file configurations per database on the instance. For each database it will pull Source information about the files and dynamically build the MOVE statements. At the end it packages them all together and adds any remaining options, such as keep_cdc. After the full statement is built the script will set the database to single user, closing any connections. It will then drop the database and execute the restoration. Dropping isn’t entirely necessary, but our Test environment is often short on space. Dropping first allows me to free up room before starting the restore. There are two things to note at this section. The first is that, while documentation will tell you that not specifying a timeout value for Invoke-Sqlcmd means that it’s unlimited, that simply isn’t true. Unless you specify one it will die after thirty seconds. Secondly, once the script successfully kicks off that restore command it will truck happily along its way to the next line, whether your restore finishes instantaneously or not (my wager is that it doesn’t). For that reason I built a Do…While loop to monitor for restore commands to finish and then allow the script to proceed. Otherwise it gets awkward trying to set your database to simple when it doesn’t actually exist yet. The commands to set that recovery option and shrink the log file are also both in the interest of saving space. Once all of that is finished, it’s just a matter of resetting variables so that the next database has a clean run and calling the aforementioned FixOrphans function to give those SQL Auth users a home. After all of the elements in the array have been processed I write an error string that I’ve been compiling to a file and call it a day. Two files will be created. RefreshLog.txt contains all of the operational information, and Errors.txt contains, you guessed it, errors. As with my other scripts, much of this will be different in your environment than it is in mine. However, I hope that this will be easily adaptable for your use and, if nothing else, that you can find useful elements that can be incorporated into your own scripts. As always, feel free to send me any questions, and I hope this helps. P.S. I chose to use Invoke-Sqlcmd so that all versions of SQL, new or old, would be compatible. For newer instances feel free to use SMO. #Import only the Cmdlet we need from the SQL Module without warning about name checking. #Set source and destination info. #Collection of errors to write to file. #List of databases to skip (ie system ones). $DBExclusionList = "master", "model", "msdb", "tempdb", "TroubleMakerDatabase"
#List of current destination databases. #Function to fix orphaned users. #Get list of available logins on the destination instance. $LoginList = Invoke-Sqlcmd -ServerInstance "$DestSQLInstance" -Database master -query "select name from master..syslogins"
#Get list of orphaned users on the destination instance. $OrphanList = Invoke-Sqlcmd -ServerInstance "$DestSQLInstance" -Database $db -query "exec sp_change_users_login 'Report'"
#Check the orphan count, proceed if there are any. #Set database user pricipal name. #Set login name from source instance. join master..syslogins S on P.sid = S.sid where P.name = '$User'"
#Make the login name a string for easy use. #Test for whether the login exists on this instance. If it does, match it to the user. #Handle orphand dbo users. These cannot be updated by sp_change_users_login. $Message = "Changing owner to $LoginName for database $db." Invoke-Sqlcmd -ServerInstance "$DestSQLInstance" -Database $db -query "EXEC sp_changedbowner '$LoginName';"
#For all other cases outside of dbo, use sp_change_users_login. $Message = "Matching user $User to login $LoginName for database $db on $DestSQLInstance." Invoke-Sqlcmd -ServerInstance "$DestSQLInstance" -Database $db -query "exec sp_change_users_login 'update_one', '$User', '$LoginName'"
#Give an informative message when the login is not in the list. $ErrMessage = $ErrMessage + "Failed to update user $User for database $db because there is no login on $DestSQLInstance." #Inform if there are no orphans for this database. Happy day! $ErrMessage = $ErrMessage + "There are no orphans in database $DatabaseName." #Get list of all database names and path to the most recent backup. #Check for database names in the exclusions list. echo "Database $DBName in Exclusion List"
#Process databases that have not been excluded. $FileInfo = Invoke-Sqlcmd -ServerInstance "$SourceSQLInstance" -Database $DBName -query "SELECT name, physical_name FROM sys.database_files"
#Set the foundation for the restore query. $RestoreQuery = "RESTORE DATABASE $DBName FROM DISK = N'$BackupName' WITH "
#Use the database file information to dynamically build the move file commands. #Build commands for data files. #Append the move file command. $FileCommand = $FileCommand + "MOVE N'$DataName' TO N'$DataFile', "
#Build commands for log files. $FileCommand = $FileCommand + "MOVE N'$LogName' TO N'$LogFile', "
#Add the completed move file commands to the overall query, and place remaining options on the end. $RestoreQuery = $RestoreQuery + $FileCommand + "REPLACE, keep_cdc"
#If database exists, set it to single user and drop it. Invoke-Sqlcmd -ServerInstance "$DestSQLInstance" -query "ALTER DATABASE $DBName SET RESTRICTED_USER WITH ROLLBACK IMMEDIATE"
Invoke-Sqlcmd -ServerInstance "$DestSQLInstance" -query "DROP DATABASE $DBName"
$Restoring = Invoke-Sqlcmd -ServerInstance "$DestSQLInstance" -Database master -query "select count(*) from sys.dm_exec_requests where command = 'RESTORE DATABASE'"
Invoke-Sqlcmd -ServerInstance "$DestSQLInstance" -Database master -query "ALTER DATABASE $DBName set recovery simple"
Invoke-Sqlcmd -ServerInstance "$DestSQLInstance" -Database $DBName -query "DBCC SHRINKFILE ($LogName, 1)"
#Clear command-building variables so that they can be reused for the next database. #Call function to fix any orphaned users. #Write to error log after processing has finished. 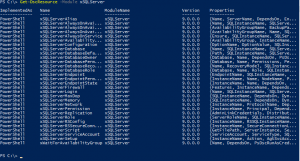 In the past we’ve explored how to use PowerShell to automate failovers on SQL Failover Clusters for Windows Updates and other scheduled maintenance. But what if you’re using Availability Groups instead of the traditional cluster? Fear not, there is still a PowerShell option for that. Usually I would have our night team use SSMS to fail over instances, but recently I transitioned to having them use the PowerShell method below. There are two primary reasons for this. 1) The system administrator does not need to have SQL Server rights in order to carry out the failover and 2) having pre-written commands helps cut down on human error. For the purposes of this example we have two nodes (AGNODE1 and AGNODE2), each having their own instances (SQLINSTANCE1 and SQLINSTANCE2) that are part of an Availability Group (AGINSTANCE). This will walk through the process of installing Windows Updates on each of those nodes. We will assume that at the outset AGNODE1 is the primary for AGINSTANCE. Install updates on AGNODE2 and reboot as necessary. 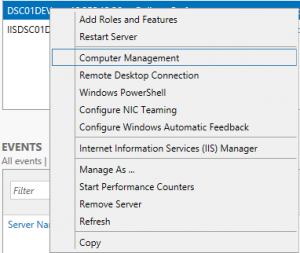 Right-click PowerShell and click “Run as Administrator”. Install updates on AGNODE1 and reboot as necessary. A couple of key points to keep in mind are this: 1) you must run the command from the destination server and 2) all of the confusing syntax is simply specifying the node, instance name, and Availability Group name for that destination server. I hope this helps, and as always feel free to send me any questions! In SQL Server, a login is an instance level object that is used for authentication. It is mapped to a database user, which controls permissions at the database level. These objects (login and user) are tied to one another via a SID. If the login is deleted and then recreated, or if you restore your production database to a test environment, those SID’s will no longer match and orphaned users will result. Information on how to resolve this situation can be found on MSDN. However, if you need to fix more than one user this can be painful. It also does not work for the “dbo” user, requiring you to take additional steps in order to repair both. In the interest of handling refreshes to our development and test instances in a more efficient way I’ve created the script below. It takes two parameters, one for the source instance and another for the destination. It will cycle through the databases on the destination instance and query the source for login information pertaining to any orphaned users. Some informational messages have been built in to help you identify issues, such as a login not existing on your destination instance. There are a couple of disclaimers. This script assumes that your logins will have the same name on both instances. If your production instance has an account named “sqlsvc” and the test instance equivalent is named “sqlsvc_test”, then it will not sync the user to that login. For the situation I’m working with there is no reliable standard in account names for me to rely on. If your environment is more standardized then please feel free to build in that additional logic. I hope this will be of help to those out there fatigued by running sp_change_users_login one user at a time. You call the script as “./FixOrphans.ps1 -SourceSQLInstance YourSourceName -DestSQLInstance -YourDestinationName”. If you don’t provide the parameters up front it will prompt you for them. #Parameters passed in for source and destination instances. #Get list of databases on the destination instance. 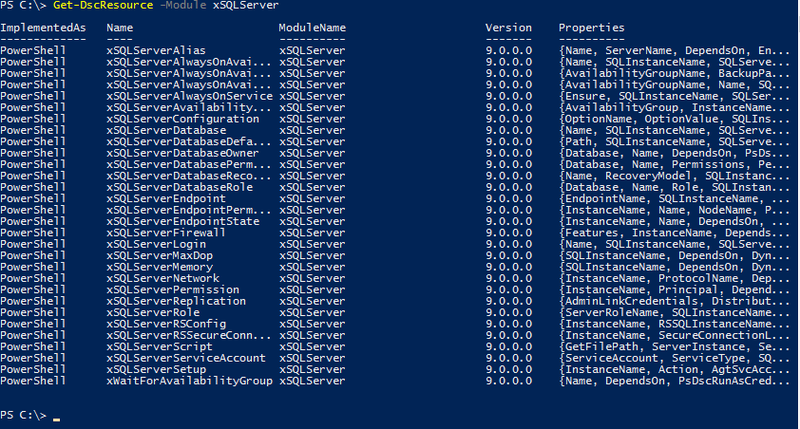 $DatabaseList = Invoke-Sqlcmd -ServerInstance "$DestSQLInstance" -Database master -query "select name from sys.databases"
#Process each database that was pulled. #Make the database name a string for easy use. #Get list of orphaned users. $OrphanList = Invoke-Sqlcmd -ServerInstance "$DestSQLInstance" -Database $DatabaseName -query "exec sp_change_users_login 'Report'"
$Message = "Changing owner to $LoginName for database $DatabaseName." Invoke-Sqlcmd -ServerInstance "$DestSQLInstance" -Database $DatabaseName -query "EXEC sp_changedbowner '$LoginName';"
$Message = "Matching user $User to login $LoginName for database $DatabaseName on $DestSQLInstance." Invoke-Sqlcmd -ServerInstance "$DestSQLInstance" -Database $DatabaseName -query "exec sp_change_users_login 'update_one', '$User', '$LoginName'"
$Message = "Failed to update user $User for database $DatabaseName because there is no login on $DestSQLInstance." $Message = "There are no orphans in database $DatabaseName." It’s an odd truth that laziness leads to better systems administration. That is, so long as it spurs you to automate and thoroughly document a repetitive or tedious task. For instance, I was recently tasked with reducing the excessive size of some system tables in our Microsoft Dynamics CRM environment. To start with, I accomplished this the way you would any one-off task. I RDP’d to each of the app nodes, disabled the service that interacts with the tables we’re performing maintenance on, RDP’d to my utility box, used SSMS to disable each of the SQL Agent jobs that might interfere (on two different nodes), opened the script (provided by Microsoft), tweaked it to my liking, and executed it. The next morning I did all of this in reverse, starting with cancelling the script. For one evening this isn’t really a big deal. However, we soon realized that in order to get the record count down to where we wanted it that several iterations of this maintenance would have to occur over the course of multiple weekends. Reviewing all the steps I’d just performed, my thought was “ain’t nobody got time for that”. Confronted with performing multiple GUI-based steps during each of these maintenance windows I did what any good/lazy Sys Admin does, I scripted it. Below you’ll find an example of what I used. I run it from PowerShell ISE, executing whichever block is applicable to what I want to do at the moment. This allowed me to go from starting up the maintenance in fifteen minutes to under one minute. (I know, 14 minutes isn’t a big deal. But when you’re tired and it’s late every minute counts.) As I mentioned before, my particular case is CRM maintenance. So basically I disable services on the app nodes, disable SQL Agent Jobs that might interfere (my database is in an Availability Group, so I disable them on both nodes), start the SQL Agent Job containing the Microsoft script referenced above, and then do it all in reverse the next morning at the end of the maintenance window. I included service status checks at the bottom because I’m paranoid and want to confirm the services are actually stopped before starting the SQL script. Also, I did not script the stopping of the job. I always hope (in vain) that the job will have finished, signaling the end of this particular maintenance need. Since both SSMS and the script run from my utilities box I check it in SSMS every morning and simply alt-tab over to ISE after stopping the job to start everything back up. It’s unlikely that you’ll have the exact situation as me, but hopefully this can give you some ideas for how to incorporate these methods into your own work. In any case I hope this helps, and feel free to contact me with any questions. #Stop and disable CRM services on the app nodes. #Disable SQL Agent Jobs on both members of the Availability Group. Invoke-Sqlcmd -ServerInstance "SQLSERVER1\CRMINSTANCE" -Database MSDB -query "EXEC dbo.sp_update_job @job_name = N'CheckDB', @enabled = 0;"
Invoke-Sqlcmd -ServerInstance "SQLSERVER1\CRMINSTANCE" -Database MSDB -query "EXEC dbo.sp_update_job @job_name = N'POA_Maintenance', @enabled = 0;"
Invoke-Sqlcmd -ServerInstance "SQLSERVER1\CRMINSTANCE" -Database MSDB -query "EXEC dbo.sp_update_job @job_name = N'Backups - Weekly Full with Archive', @enabled = 0;"
Invoke-Sqlcmd -ServerInstance "SQLSERVER1\CRMINSTANCE" -Database MSDB -query "EXEC dbo.sp_update_job @job_name = N'Backups - Monthly Full with Archive', @enabled = 0;"
Invoke-Sqlcmd -ServerInstance "SQLSERVER2\CRMINSTANCE" -Database MSDB -query "EXEC dbo.sp_update_job @job_name = N'CheckDB', @enabled = 0;"
Invoke-Sqlcmd -ServerInstance "SQLSERVER2\CRMINSTANCE" -Database MSDB -query "EXEC dbo.sp_update_job @job_name = N'POA_Maintenance', @enabled = 0;"
Invoke-Sqlcmd -ServerInstance "SQLSERVER2\CRMINSTANCE" -Database MSDB -query "EXEC dbo.sp_update_job @job_name = N'Backups - Weekly Full with Archive', @enabled = 0;"
Invoke-Sqlcmd -ServerInstance "SQLSERVER2\CRMINSTANCE" -Database MSDB -query "EXEC dbo.sp_update_job @job_name = N'Backups - Monthly Full with Archive', @enabled = 0;"
#Kick off SQL Script against the Availability Group name. Invoke-Sqlcmd -ServerInstance "SQLAGCRMINSTANCE" -Database MSDB -query "EXEC dbo.sp_start_job N'CRM_SysTableCleanup';"
#Enable SQL Agent Jobs on both members of the Availability Group. Invoke-Sqlcmd -ServerInstance "SQLSERVER1\CRMINSTANCE" -Database MSDB -query "EXEC dbo.sp_update_job @job_name = N'CheckDB', @enabled = 1;"
Invoke-Sqlcmd -ServerInstance "SQLSERVER1\CRMINSTANCE" -Database MSDB -query "EXEC dbo.sp_update_job @job_name = N'POA_Maintenance', @enabled = 1;"
Invoke-Sqlcmd -ServerInstance "SQLSERVER1\CRMINSTANCE" -Database MSDB -query "EXEC dbo.sp_update_job @job_name = N'Backups - Weekly Full with Archive', @enabled = 1;"
Invoke-Sqlcmd -ServerInstance "SQLSERVER1\CRMINSTANCE" -Database MSDB -query "EXEC dbo.sp_update_job @job_name = N'Backups - Monthly Full with Archive', @enabled = 1;"
Invoke-Sqlcmd -ServerInstance "SQLSERVER2\CRMINSTANCE" -Database MSDB -query "EXEC dbo.sp_update_job @job_name = N'CheckDB', @enabled = 1;"
Invoke-Sqlcmd -ServerInstance "SQLSERVER2\CRMINSTANCE" -Database MSDB -query "EXEC dbo.sp_update_job @job_name = N'POA_Maintenance', @enabled = 1;"
Invoke-Sqlcmd -ServerInstance "SQLSERVER2\CRMINSTANCE" -Database MSDB -query "EXEC dbo.sp_update_job @job_name = N'Backups - Weekly Full with Archive', @enabled = 1;"
Invoke-Sqlcmd -ServerInstance "SQLSERVER2\CRMINSTANCE" -Database MSDB -query "EXEC dbo.sp_update_job @job_name = N'Backups - Monthly Full with Archive', @enabled = 1;"
#Start and enable CRM services on the app nodes. As much as we’d all like to set up our SQL instances and never again let anyone touch them, that’s just not possible in real life. We live in a world where entities, for good or for evil, are constantly exposing vulnerabilities both in the SQL software and Windows itself. For that reason it is the responsibility of good DBA’s to keep their systems updated, and that means failovers. It is typical in many environments to have a separation of duties, often keeping DBA’s from having control over the Windows Failover Cluster itself. In my particular case I actually have access to the cluster. However, our OCC (Operations Command Center) is tasked with carrying out Windows Updates on a regular basis. Letting them fail instances over means the servers get updated regularly (and also that I have to get up in the middle of the night for one less thing). I needed a way to allow their team members, regardless of experience level, to carry out Windows Updates on our cluster. Enter PowerShell scripting. 1. All instances are named with a particular convention. In this case that is “SQL Instance #”. 2. The instance numbers have their permanent homes on nodes of the same number (ie SQL Instance 1 belongs on sqlnode1). 3. The script is run on one of the nodes of the cluster. 4. The script is run in PowerShell ISE section by section, not all at once. With that in mind I present the code to you below. It is written in a manner such that a Systems Administrator would be reading it as an instruction sheet and carrying out the tasks on your behalf. I am sure there are more elegant and efficient ways to accomplish this task, but this has been successful for us and I hope it can help you in some way. If you have any questions please feel free to comment or contact me on Twitter. Enjoy! #### Note: This list is mostly random. It only has two goals.